Our loans are structured with the unique needs of farm operations in mind. Whether it's the purchase of livestock or machinery, operating financing, or a commercial lease or mortgage, your personal lender will put together a financing plan designed to meet your needs. Benefit from one of our helpful lending programs today. USDA's Farm Service Agency provides financing for the purchase of farmland if you have 3-10 years farming experience and currently own less than 25% of the average acreage in your county. This program provides affordable financing to new farmers for capital purchases including farmland, improvements and new or used farm equipment. If you're 18 years or older and you have no prior ownership in a substantial amount of land, this program has great benefits. The State Linked Deposit Program offers Illinois farmers with affordable financing for operating capital, livestock and equipment purchases. In this program, the State of Illinois deposits money at Peoples National Bank for up to one year - funds which the bank loans to farmers for up to one year. This program provides financing to farm operators who have encountered poor earnings from adverse weather and whose financial position is expected to improve over time. Purposes include the financing of operating capital, equipment, livestock, farmland and improvement purchases. Farmer Mac I provides financing for conventional ag loans. 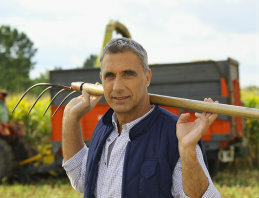 Farmer Mac II is also available for farming operations that qualify for the Farm Service Agency Guaranteed Loan Program. These loans allow your operation to finance farm land for 5 to 15 years with amortizations of 15 or 25 years. Fixed and adjustable rates are available. For our more mature farming operations, "choice" pricing may be available.